It’s easy to capture notable everyday moments nowadays, especially with advanced smartphone technology - by simply pointing and clicking. With Samsung, it is essential to capture the entire feeling of the moment, and bring it to life for the world to see. Built to capture those everyday moments in your life and to enhance them to make them even more extraordinary, Samsung introduces the new Galaxy J7+. The Galaxy J7+ boasts of a Professional Dual Camera to showcase every single detail of your day. Equipped with two rear cameras––one 13MP sensor with an f/1.7 aperture lens and a 5MP sensor at f/1.9 aperture, both of which are responsible for delivering professional-quality post-shot depth. These dual lenses also equip the Galaxy J7+ with the Live Focus feature which allows you to control the amount of blur in a shot during and after taking a photo. It didn’t go shy with its front shooter, too, with its 16MP f/1.9 selfie camera. With the Galaxy J7+’s dual leans camera, you have no excuse to capture and enhance every moment, may it be with friends, family, or your fur baby! For added fun, entertainment, and excitement, the Galaxy J7+ also comes with the new built-in Galaxy stamps and stickers in its Mobile Photobooth that would let you decorate and enhance your photos to really bring out the fun! The assortment of colorful stickers and stamps, as well as filters, will let you add a touch of personalization, playfulness, and more color to your photos. With the fun Mobile Photobooth coupled with the Galaxy J7+’s Professional Dual Camera capable of shooting in low-light, each moment is preserved in pro-quality. Beyond delivering hours of entertainment and fun with its 3,000mAh battery, the Galaxy J7+ enhances your life by providing an all-around reliable and powerful performance, thanks to its 2.39GHz Octa-Core processor for seamless, high-speed multitasking and a 4GB RAM and memory expandable up to 256GB for all the apps you enjoy. “For those who want to experience the dual camera features of the flagship Galaxy Note8, the Galaxy J7+ offers the same premium and powerful experience. Its features let people enhance every moment of the day by expanding what a smartphone camera can do. The Galaxy J7+ is the best in its segment with flagship features and value for money,” said Nio Judalena, Head of Marketing for Mobile Communications Business, SEPCO. 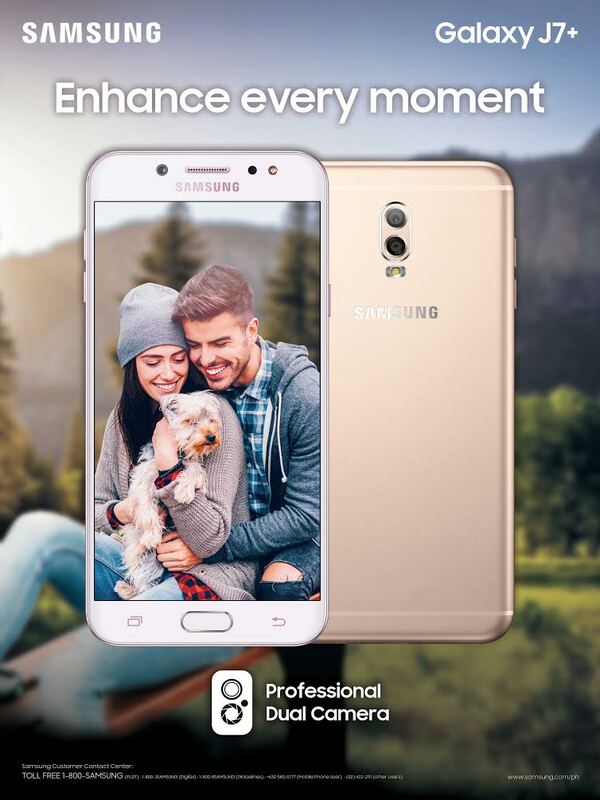 Indeed, the Samsung Galaxy J7+ is exactly what you need to enhance every moment of everyday. The Samsung Galaxy J7+ will be available for P19,990 starting on October 14 at all Samsung Experience Stores and dealers nationwide. You can avail it at 0% interest for 9 month on Home Credit, or 0% interest for 12 months through credit cards.